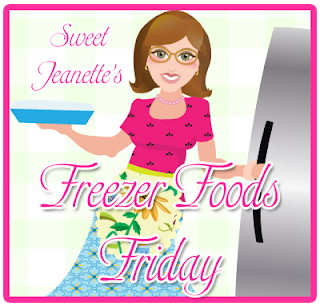 It's Freezer Foods Friday again! Today, I'm not sharing a recipe but some helpful hints. When I taught this as a class these were some of the things I talked about. It might be "old news" to you, a refresher, or a new slant. However you receive it, I hope there is something you can use and add to. There are many types of "freezer cooking" methods. There's the OAMC (Once a Month Cooking); TAMC (Twice a Month Cooking); Mini Sessions, preparing meals by categories, the methods and lists are as vast and varied as individual's tastes. Whatever "style" you adopt, the most important rule is organize your recipes! You can have a card-file system or notebook file system. I use the notebook pages because I can have each recipe printed on an individual page, put in a page protector and place in a three ring binder. Before cooking day, study each recipe to decide on the order in which you'll prepare them. It may sound like overkill, but it really helps the process run more smoothly. Once you've decided, put the pages in order in which you will prepare them. The page protectors are great because I almost always spash! All I have to do is wipe these clean. Try only a few new recipes each month. (That way if it flops, it was only one meal!) Your menu should be mostly ones your family already likes. If you're not sure a family favorite will freeze well, when you prepare the dish, take out a portion and freeze it. "Test" it in a week or two to see if it passes the test. If so, great! You've got another freezer-food to add to your list. And, well, if it doesn't, you haven't wasted time and money. ok, this is getting kind of long, and I don't want to bore you this week. Next week, I promise a recipe. Actually it's going to be good. A bunch of marinades and ideas for those. I love doing these, just buy the meat, dump it in the ziplock bag with the marinades... that's it. And when it's thawing - it's marinating! Now, it's your turn. Got a tip, idea or recipe for making ahead? Come join the party! Please link to this site so everyone can enjoy! Hi! I'm a new follower from Friday Follow! I hope you can come visit me! Have a great Friday! Hi! following back from Friday Follow! have a greAat weekend! Cute, cute blog! Glad I found you! Now following from Friday Follow - hope you'll drop by soon! Following you via Friday Follow. I love your blog. I just started freezer cooking and am loving it. Right now I'm just making huge meals and freezing that way. I have a massive pot of chili going right now. Looking forward to more inspiration. Come on over to my blog and see what I have to share today...See you soon. Hello! I'm visiting your cute blog from Friday Follow! I'm a new follower! Please check me out at 'A Gal Needs...' I'd love to make friends! Hey Jeanette! I just found you on Tip Junkie's site. Great blog. I applaud you for your cooking expertise. I could use some help in that area. Glad to be a new follower and I'm putting your button on my sidebar too. This is great for those days that go crazy without warning! Thanks. My mom freezes everything. I have not been great at it. The most successfully frozen things around here is warts! I usually cook on Sundays but I need to start freezing foods. I get lazy as the day goes on. I need to figure out how to start doing this. I tried one of those local places where you go and make food to freeze based on their menu and their ingredients. Loved the concept but my family hated the food. (They have VERY simple palates.) One of these days I'll figure it out!! You Just Can't Make These Up! New Give-Away at Cheri's blog! We have a Winner for the Quilted wallhanging!